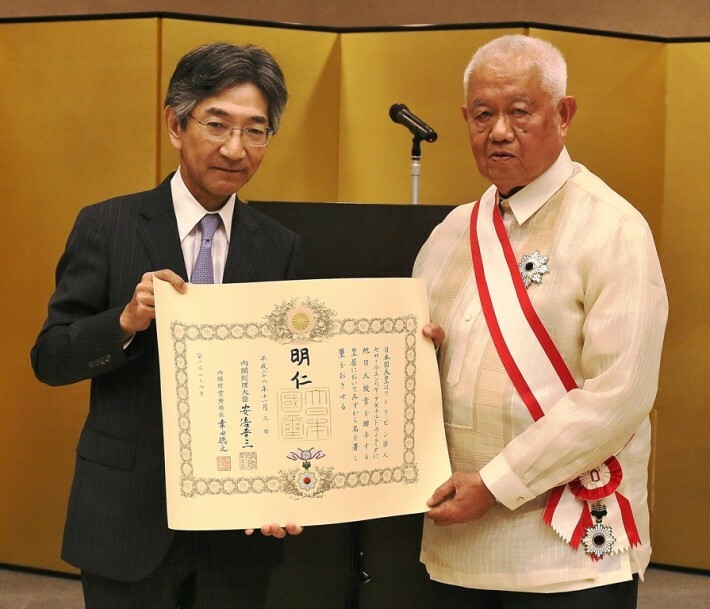 The Government of Japan conferred on former Philippine Prime Minister Cesar Enrique Aguinaldo Virata the Imperial Decoration of the Grand Cordon of the Order of the Rising Sun at fitting ceremonies held on November 24, 2016 at the official residence of Japan’s Ambassador to the Philippines, H.E. Kazuhide Ishikawa. The Award was given in recognition of PM Virata’s contributions in promoting friendly relations and strengthening economic cooperation between Japan and the Philippines. As the Philippine Finance Secretary, Mr. Virata helped ratify the Philippines-Japan Treaty of Amity, Commerce and Navigation, the landmark agreement that normalized postwar trade relations between the two countries in 1960 although it only took effect in 1973. PM Virata also had an active role in channeling Japanese official development assistance (ODA) into the Philippines. After a distinguished government career, he encouraged Japanese direct investments to the Philippines and extended consultancy services for Japanese companies and undertook policy studies for government institutions alike as lead consultant of C. Virata & Associates. The award also recognized PM Virata’s guidance in Japan’s policy implementations through his 10-year chairmanship of the Advisory Committee of the Japan International Cooperation Agency (JICA) Philippines Office. Finally, the Japanese Government expressed hope that PM Virata would continue to have an active role in strengthening ties between Japan and the Philippines. PM Virata served as Secretary of Finance of the Philippines from 1970 to 1986 and as Prime Minister from 1981 to 1986. He is the eponym of the University of the Philippines Cesar Virata School of Business. PM Virata was the 23rd recipient of the Philippines Japan Society Medal of Merit in 2001. The Grand Cordon of the Order of the Rising Sun was established by Emperor Meiji in 1875. It is awarded to those who have distinguished achievements in international relations, promotion of Japanese culture, notable advancements in their field, development in welfare, or preservation of the environment.